I do my best to have a positive perspective on what my parents provided me because as a parent, I now understand they were doing their best. Like I said in one of my last posts about ways I’m parenting differently from my parents, “I am deconstructing the parenting methods that were used with me and constructing them to fit the way I want to lead my children.” One of the ways I am constructing on my parents’ methods is by not shooing my children away from doing things with me, and this includes house chores. 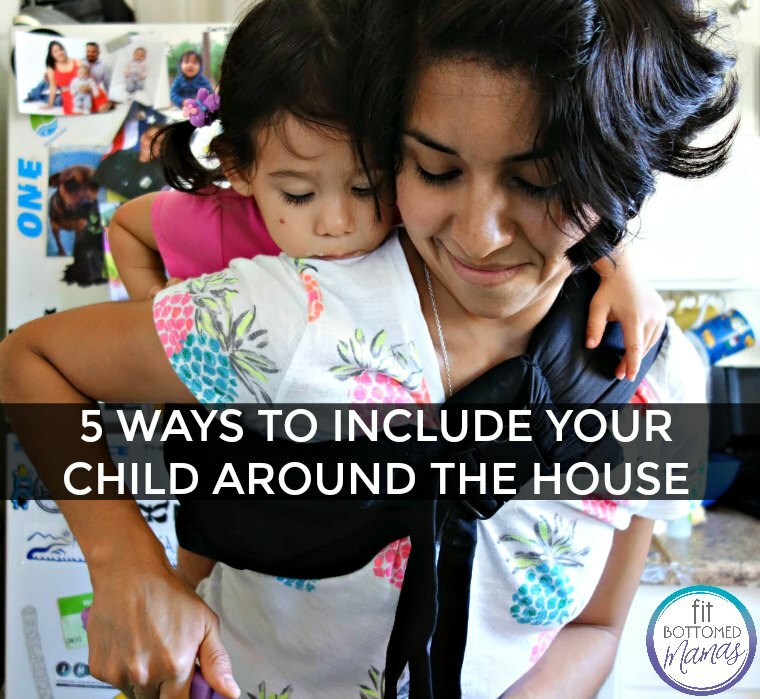 I decided to expand on that post to share some ways I include my 5 and 2-year-old around the house. I want to inspire my children to be involved in our home — not only in making a mess, but cleaning it up, too. I want to shift the paradigm of chores from boring expectations to duties we do as a family to maintain a healthy lifestyle. The only way I can think of doing this now is to have my children join me in completing household tasks. In doing this, my children will not expect chores to be done for them, but learn to do them, as well as be grateful when chores are done for them. 1. In the kitchen. I work on being conscious of my children’s ages, but I also try not to limit their potential. I give them easier tasks like putting silverware away because it’s something they can safely reach. As they get older, I will allow them to reach into higher areas such as the cupboards. I also include my children in cutting vegetables for meals. Don’t worry, neither of my children uses a knife on their own. All of the cutting is guided by me. This has worked out well for us because it has given me the opportunity to teach my children about knives. 2. Laundry. Laundry is the easiest task to include my children in because there is not much room for error or a mess. I include them by having them help me sort clothes and put the clothes in the washer and dryer (with the help of a step stool). Easy peasy, right? 3. Around-the-house cleaning. It’s important to provide age-appropriate tasks to set my children up for success. It works to be specific with my children about what they are to do, show them how to do it by modeling it for them slowly, and do it with them at least once before allowing them to do it on their own. Also, explaining the tools they are using and how the tools help is important for a successful cleaning experience. 4. Pet care. This one varies on what type of pet you have. We have a dog, so the way I include my children with pet care is having them help ensure that our dog has food and water. The kids get to check on the level of food and water, and Mom and Dad get to refill. 5. Gardening. We live in a small apartment. We don’t have space to have a big garden, but we love plants. My husband has used our balcony and our living room to have plants. I admire the way he has included our children in his gardening efforts. (I can’t take credit for this one.) The kids have their own watering cans and love helping Dad water the plants. It’s an easy and great way to spend time with the kids while instilling an appreciation for living things other than animals.